Helen hosted a Sale-a-Bration workshop last Saturday and I promised to post pics of my samples and the make and takes we made. A great time was had and Helen earned lots of free stamps. Met some new people and lots of old friends. So, here goes. First, this valentine using the Sweet Centers and some of the new DSP Sending Love. Also used the wide oval and scalloped oval punches and the Elegant Bouquet Embossing folder. This is my mirrored Chocolate Bunny sample, given away as a door prize. Computer generated the sayings to punch out with Word Window and mount on Modern Labels. This was one of our make and takes using the Chocolate Bunny, the wide oval and scalloped oval punches, the greeting out of Very Vanilla, Well Scripted, Close to Cocoa, Chocolate Chip and Bashful Blue cardstocks. This is my sample from Garden From the Heart, colored with markers to match the Green Galore, Gable Green, YoYo Yellow and Very Vanilla cardstocks. Fussy cut the bonnet. Used the wide oval and scalloped oval punches again with Thanks from Sincere Salutations. Double edged layers with Eyelet Border punch. This is a simple sample using fussy cut My Matryoshka nesting dolls, Pale Plum and Elegant Eggplant cardstock. Colored the dolls with my markers and watercolor pencils. Congratulations is from Well Scripted. Inside it says “We knew you had it in you.” Ticket Corner punch finished it off nicely. This is another sample using My Matryoshka on a leftover bit of Real Red cut with the Top Note die. Happy Birthday is from Well Scripted. Brought this to workshop for non-members of my stamp club (non-SU) who hadn’t seen or made it at January meeting. Gave it away as a door prize. Details to make it are in January post. This is almost our second make and take. Final version had a Pretty in Pink wreath made with scalloped circle and 1 3/8” circle punches instead of what is shown here. Make and take also was done as a gate fold, with opening under the heart. Added on 2-11-10: This is Helen's hostess gift! 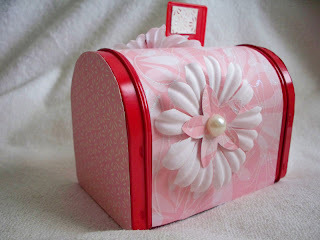 Used Sending Love DSP to cover one of Target's $1 mailboxes, then put some pretties on it. Stuffed that cutie with pastel Kisses! She loved it! WOW what great designs. No wonder you had such a successful workshop. Your cards are wonderful. I especially love the bunnies, and the gate fold card.